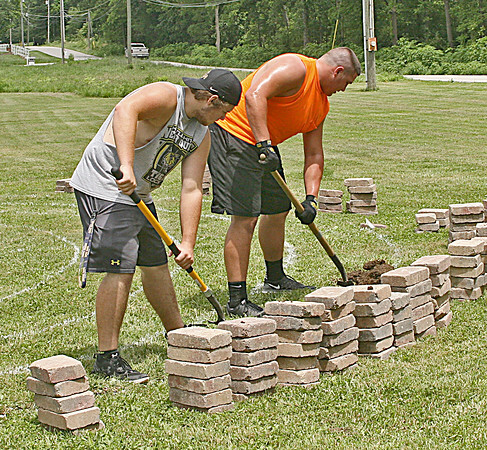 LABRYNTHINE: Lebanon High School football players Logan Dickey (left) and Luke Terrill are part of a group helping to construct a labrynth for St. Peter's Episcopal Church. The group, which includes fellow football players Bryce Marshall, Elijah Allen and Trevor Boyne, worked all day Friday and will continue Sunday on the labrynth, which will be a place of meditation and prayer for community members, said church member Dana Halstead. Indianapolis resident John Ridder has helped construct labrynths all over the world with his group, Paxworks. Unlike mazes, labrynths are designed so that a person can walk the entire course without searching for a way out. "The beauty of it is that anyone can approach on their own terms," Ridder said. "You don't have to believe in any religious dogma to walk it."